How to determine your ring size is a question that most people will come across at some point during their lives. As people have different sized fingers there are different sized rings. Having too small a ring will cause the ring to get stuck when your hands are hot or late in the day and having too large a ring will cause the ring to slip off when your hands are cold or early in the morning. People with larger knuckles can wear slightly looser rings than those with narrow knuckles and slimmer fingers. Essentially the narrower your knuckles in comparison with the rest of the finger the tighter your ring should be. The proper way to determine your ring size is to use a set of gauge rings. 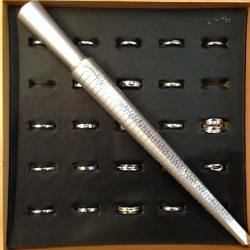 Most jewellers will have a set in steel, for customer use or will be able to provide you with a plastic set for you to take away as it is best to measure your ring size at different times during the day to ensure the most accurate fit (This is especially significant for people whose fingers are subject to swelling). 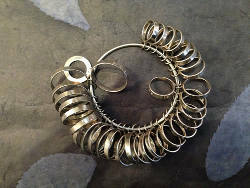 The correct way to use the gauge rings is to try sizes from the large end until you come to a size that won't go on and then reverse the process trying larger sizes until you find one that is comfortable. If you already have a ring that is a good fit you can use this as a gauge and use a set of calipers to determine the inner diameter of the ring. For the best accuracy with this method of measurement, take the average of three readings at 60 degree intervals around the ring as this will compensate for the fact that the ring may have become slightly oval with use. This will give you an inner diameter size, multiply this by Pi (3.141592) to get an inner circumference with which you can consult our ring size conversion table. Alternatively an existing ring that fits well can be measured by a jeweller, using a tapered ring sizing stick, known as a mandrel. 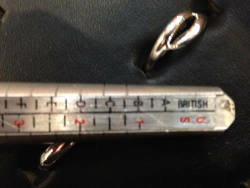 Measurements using the mandrel can vary by about half a size if done by different jewellers as some take an edge of the ring measurement and some take a mid ring measurement. Wrapping string around the finger to determine the circumference of the finger is probably the worst method of determining ring size as the string will just take the shape of the finger rather than giving a best fit circle. Printing out a paper ring size chart from the internet is also fraught with inaccuracies as different printers will change the intended output size and different types of paper will cause different levels of bleed of the ink into the paper.